The Record Profit Canard Continued: A look at bank performance in the post-crisis period. Suppose someone said to you, “Kevin Costner is such a great actor, he should be Secretary of Defense.” How would you respond? Would you fight the premise – what about Waterworld, Robin Hood,The Bodyguard, The Postman, etc.? Or do you move straight to the illogic – why would a great actor be qualified to run the Pentagon? We have faced a similar conundrum when frequently faced with the argument, “Banks are highly profitable, so any review of banking regulation is inappropriate.” Should we challenge the (false) notion that banks are highly profitable, or note that it is quite possible for a profitable industry to be badly regulated, or for an unprofitable industry to be well regulated? We have spent some time on both, but today is a Waterworld, premise-fighting day. We think it’s important to understand the state of bank profits, and how they relate to regulation and bank safety and soundness. We find that measures of bank performance are well below historical norms. 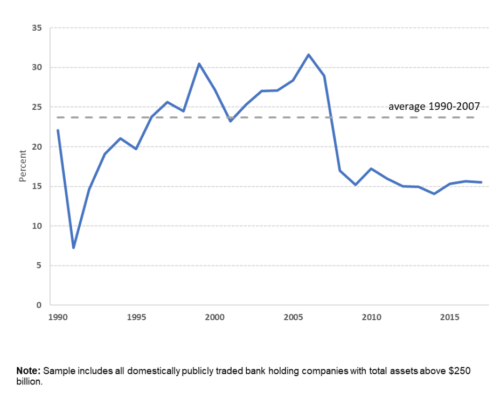 The figure below depicts bank profitability as measured by the return on tangible common equity (ROTCE) since 1990. This is a measure of bank profits typically used by market analysts and it is defined as the ratio of core income to tangible common equity. The chart shows that post-crisis, average ROTCE for large banks has remained at a level that is well below its long-run average. 1Core income is defined as net income attributable to the holding company less realized gains on securities (after tax) plus goodwill impairment losses (after tax). Tangible common equity equals shareholders’ common equity less intangible assets, excluding mortgage and nonmortgage servicing assets and purchased credit card relationships. Looking at the market value of U.S. banks relative to its accounting value (also known and the market -to-book equity ratio) one finds that the performance of the banking sector also lags behind the aggregate market-to-book of the entire universe of publicly traded firms in the U.S. It is important to analyze the market value of equity because it accurately reflect banks’ economic value, as it is determined by expected future changes in banks’ cash-flows. 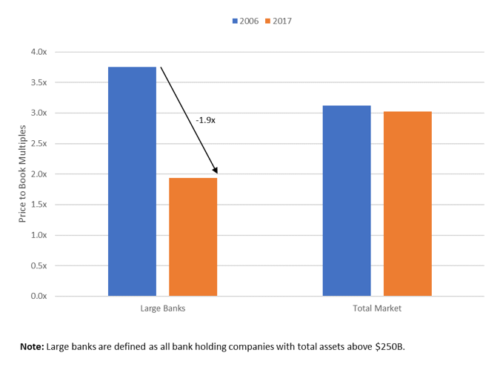 As shown by the leftmost bars in the figure below, the market-to-book ratio of U.S. banks with more than $250 billion in consolidated assets was compressed from 3.8x to 1.9x between 2006 and 2017. As shown in the bars to the right, the market-to-book ratio of all publicly traded firms in the U.S. remained roughly unchanged during the same period. As noted by Calomiris and Nassim (2014), the fact that market-to-book ratios of banks are still depressed a decade post-crisis cannot be explained with delays in the recognition of losses; instead, it must be driven by lower projections of banks’ income. Each of these four factors would lead to a reduction in ROTCE. For instance, higher capital requirements force banks to reduce leverage and lead to a lower ROTCE because the level of profits will be distributed over a larger equity base. Similarly, lower profitability can also be driven by lower net interest income, reduced fee income or higher costs. 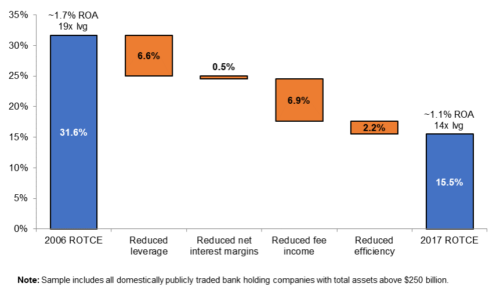 As shown in the chart below, more than 80 percent of the decline in banks’ ROTCE in the post-crisis period is accounted for by lower fee income and reduced leverage. The impact of higher capital requirements on ROTCE via lower leverage is to be expected because large banks hold substantially more common equity tier 1 capital now relative to the pre-crisis period. Nonetheless, it is remarkable that lower fee income has roughly the same impact on explaining the changes in ROTCE post-crisis as reduced leverage. As shown in our earlier work, the decline in fee income is widespread across the major components of noninterest income, including investment banking, trading and advisory fees, servicing fees and other fee income. Lower securitization income, which was perceived to have a high value before the crisis, accounts only for less than 20 percent of the decline in fee income. Lastly, reduced efficiency explains nearly 15 percent and interest income from loans accounts for almost none of the post-crisis decline in ROTCE. As noted in our previous analysis the decrease in efficiency is likely explained by the increase in compliance costs (stress tests and consumer compliance). In summary, looking at the level of bank profitability is not a valid reason to dismiss the need to simplify and recalibrate banks’ capital requirements. This includes reducing the number of capital requirements along the lines of the stress capital buffer proposal, improving transparency around the supervisory stress tests, reducing the volatility of capital requirements and updating the calibration of the GSIB surcharge that takes into consideration other post-crisis reforms. These regulatory changes will increase banks’ market values and, as pointed out by Sarin and Summers (2017), will make banks more resilient during the next crisis.